Belize NMS: Relatively moist conditions conditions prevails over the area. 24-hour forecast: Sunny with a few cloudy spells today along with a few showers and isolated thunderstorms mostly over central and southern areas, decreasing. Partly cloudy tonight with a few showers or isolated thunderstorms, mainly south. General Outlook: (Sun. and Sun. night) Sunny with a few cloudy spells with a few showers and isolated thunderstorms, mainly over the south. Today E-SE 10-20 kts Choppy 3-4 ft A FEW SHOWERS AND ISOLATED THUNDERSTORMS, DECREASING. Tonight E-SE 10-20 kts Choppy 3-4 ft A FEW SHOWERS AND ISOLATED THUNDERSTORMS MAINLY OVER THE SOUTH. Tomorrow E 10-20 kts Choppy 3-4 ft A FEW SHOWERS AND ISOLATED THUNDERSTORMS MAINLY OVER THE SOUTH. Outlook E-SE 10-20 kts Moderate 4-6 ft A FEW SHOWERS AND ISOLATED THUNDERSTORMS MAINLY OVER THE SOUTH. Broad anticyclonic wind flow covers the western half of the Caribbean Sea from 700 mb to 250 mb. A 700 mb ridge lines up along 87W/88W from El Salvador to the northern part of the Yucatan Peninsula, in line with the surface trough that is in the same area. 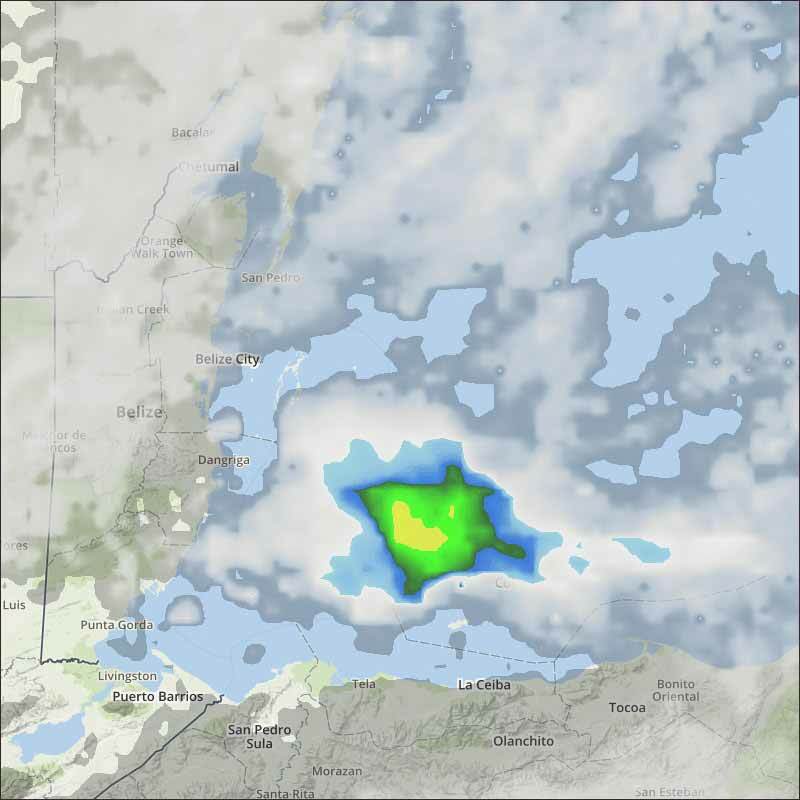 Precipitation: numerous strong rainshowers in southern Honduras and eastern El Salvador. rainshowers are possible elsewhere, from 17N southward from 76W westward, including in interior sections of Central America. The Monsoon Trough is along 09N/10N, passing from the eastern Pacific Ocean to Costa Rica, Panama and northern Colombia. 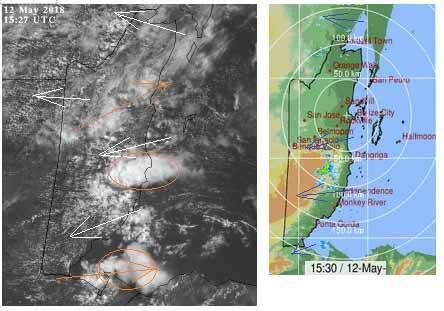 Precipitation: scattered to numerous strong rainshowers are from 10N to 11N between the coast of Colombia and 77W. scattered moderate to strong rainshowers are within a 30 nm radius of 11N82W. Convective debris clouds, from earlier already- dissipated precipitation, are elsewhere from 14N southward from 76W westward. Fresh to strong trade winds will prevail in the south central Caribbean Sea through next Wednesday. NE swell will bring seas to 8 feet in the southern part of the tropical North Atlantic Ocean forecast waters through the weekend. 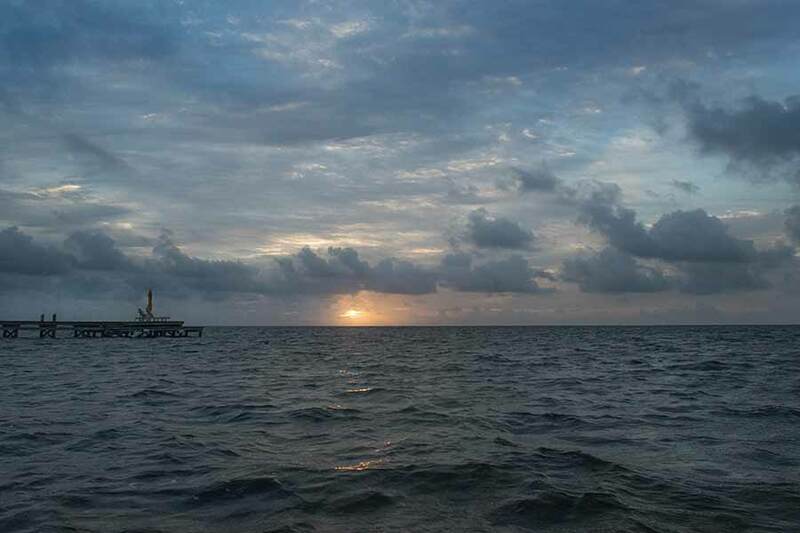 On Ambergris Caye this morning we have an East-SE wind blowing making the sea state around our barrier reef moderate. Today's expected high is 88 f.
Significant areas of Caribbean cloud coming in from the ENE clashing with a lot of high level cloud from the SW. Causing isolated rain in some areas of Belize, from PG, Stann Creek to Corozal. Today will be a real mixture of mainly cloud, some sunshine and the odd chance of some rain showers. The Cloud & rain picture. 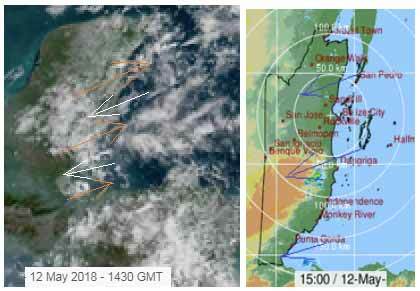 Several ITCZ type swell-ups due to the clashing, which are causing some rain. White arrows are the regular clouds we see, usually the Caribbean wind clouds. Orange arrows are the high-level winds, which are often hard to see, but do have significance on our weather.